Falls Creek's village shuttle service operates daily during the declared snow season. Dedicated shuttle services operate every day of the declared snow season along two designated routes. Shuttles operate between 8:00am to 5:30pm and are free to access. 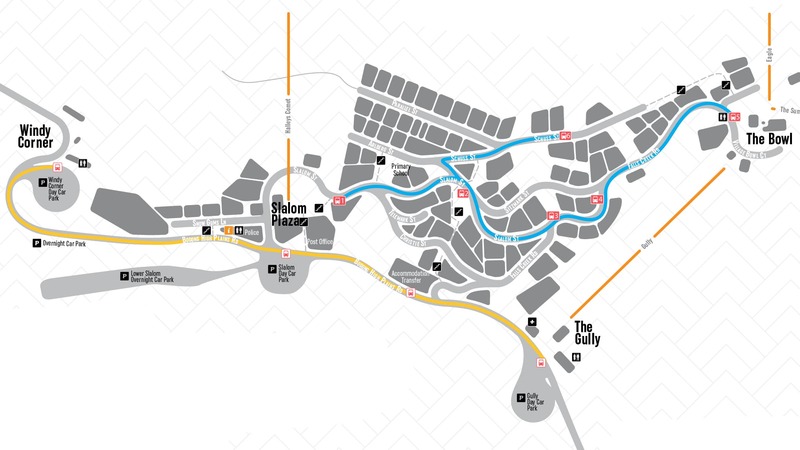 Shuttles loop from Slalom Plaza to the Village Bowl, to Frueauf Village and back to Slalom Plaza as required. Under normal conditions visitors should not encounter a wait of more than 20 minutes. The shuttle has a queue monitoring system which allows the service to direct resources to key areas as soon as possible. Shuttles loop between stops during hours of operation. Under normal conditions wait times should be no longer than 20 minutes. The shuttle has a queue monitoring system which allows the service to direct resources to key areas as soon as possible. If you encounter a longer wait please contact Visitor Information on 5758 1200. There are easy ways to ski or snowboard back to your accommodation and avoid the need to use the Village Shuttle Service. Village Bowl Precinct & Falls Creek Road: Take the Green run "Broadway" by heading away from Cloud 9 under the Halleys Comet lift line. Beginners may prefer to get to the junction for Broadway via "Rudi's Trail". If you are in the Scott Chairlift region you can get to Broadway by taking "Day's End" heading underneath the Eagle Chair. Slalom Plaza Precinct: Take the Green run "Wombats Ramble" by heading toward Drovers Dream from Cloud 9. This will take you direct to Slalom Plaza and the final stretch borders the back of the upper properties on Snowgums Lane. Schuss & Parallel St Precinct: Take Broadway as if heading to the Village Bowl. Just before the Eagle Chair, Ory's Trail takes you to the top end of the village. Ory's trail is a bit steeper and narrower that Broadway so beginners should take the redirect which comes out at Cedarwood lodge. Follow the signs as you reach the Aqueduct.